Brinzolamide is a carbonic anhydrase II (CA-II) inhibitor that inhibits aqueous humor production to reduce elevated intraocular pressure. 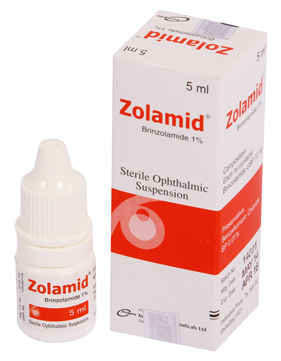 Zolamid Sterile Ophthalmic Suspension is indicated in the treatment of elevated intraocular pressure in patients with ocular hypertension or open-angle glaucoma. Instill 1 drop in the affected eye(s) 2-3 times daily. Zolamid may be used concomitantly with other topical ophthalmic drug to lower intraocular pressure. If more than one topical ophthalmic drug is being used, the drugs should be administered at least ten minutes apart. Reported side effects are blurred vision and bitter, sour or unusual taste. Other side effects are blepharitis, dermatitis, dry eye, foreign body sensation, headache, hyperemia, ocular discharge, ocular discomfort, ocular keratitis, ocular pain, ocular pruritus and rhinitis. The concomitant administration of Brinzolamide 1% ophthalmic suspension and oral carbonic anhydrase inhibitor is not recommended due to no additional benefits. If hypersensitivity reaction occurs after instillation patients should be advised to discontinue the use of Brinzolamide and consult with physicians. It is not known whether Brinzolamide is secreted in human milk or not. Caution should be exercised when Brinzolamide is administered to a nursing mother. Safety and effectiveness are not established in Pediatric patients.